Mitsubishi has launched a commercial vehicle variant of its Outlander PHEV plug-in hybrid SUV, on sale now in the UK. 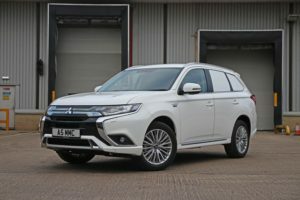 The PHEV is based on the mid-range Outlander Juro SUV and is fitted with a floor-to-ceiling bulkhead located behind the front seats, which is solid at the base with the top half comprising a protective metal mesh. The load area measures 1,650mm in length, 1,000mm in width (measured between the wheel arches), 800mm high at the tailgate and has a maximum payload of 510kg. The Mitsubishi Outlander PHEV Commercial, eligible for the Plug-In Van Grant, uses the same 4WD set-up as the passenger car, with an electric motor on each axle. The electric drivetrain runs alongside a 2.4-litre four-cylinder petrol engine, with automatic transmission.